On Tuesday, for instance, the Philadelphia Inquirer reported that in 59 inner-city voting divisions, Mitt Romney received no votes. Aside from the immediate link to Godwinism, Cashill ignores inconvenient facts. If Cashill had actually read beyond the headline of the Inquirer article, he would have seen that this is roughly as well as John McCain did in Philadelphia in 2008, in which he got no votes in 57 precincts. The Inquirer goes on tostate that there is "little hard evidence" of fraud despite those results because those precincts are "almost exclusively black" with very few registered Republicans. As one political science professor quoted in the article said, many parts of Philadelphia and other big cities simply lack Republican voters, a fact of campaigning that has been true since Franklin D. Roosevelt's New Deal. Cashill also fails to make mention of the fact that the opposite is true in other areas of the country -- Obama got no votes in some precincts in Utah, for instance. We suspect that Cashill won't be screaming "voter fraud" about that. Ronald Kessler uses a Nov. 15 Newsmax article to allow Stephen Law, head of the American Crossroads super PAC, to spin away the election results by insisting that they "do not represent a seismic shift but show Republicans need to work harder at wooing certain population groups." Curiously, Kessler doesn't bring Crossroads' own dismal election record, other than to note that "Between American Crossroads and its affiliate American Crossroads GPS, Law put nearly $200 million into beating Obama." In fact, Crossroads failed across the board. According to the Sunlight Foundation, only 1.29 percent of the $104 million American Crossroads spent ended in the desired result, while about 41 percent of the $70 million Crossroads GPS ended in the desired result. None of that money, by the way, resulted in winning candidates. Rather than holding Law's organization accountable, Kessler let him spin away and blame Romney's loss in part on demographic changes, the failure to defend Romney against the Obama campaign's early depiction of him, and failure to breach Obama's "likability firewall." Needless to say, Kessler remains silent on his pre-election prediction of a Romney landslide. It seems that resident WorldNetDaily race-baiter Colin Flaherty believes that all blacks accused of "black mob violence" are, by definition, guilty of it, and that no police investigation is necessary. City officials in Baltimore knew exactly what to do when a mob of black people beat John Mason almost to death. But that's not "blaming the victim" -- that's called investigating a crime. If you have a crime in which the motive is not obvious, as appears to be the case here, you investigate to find out what happened. At no point did the police spokesperson blame the victim -- he simply expressed a desire to find out the circumstances of the crime, which includes investigating any possible connections between the victim and the perpetrator. That's standard police procedure. But Flaherty apparently doesn't want any investigation. The perpetrators were black, and that's all he needs to convict. Randy Hall is in a bit of a huff in a Nov. 14 NewsBusters post, complaining that Papa John's Pizza and its CEO, John Schnatter, is being criticized by MSNBC's Ed Schultz and other "liberal" writers for complaining about having to (slightly) raise prices and (not so slightly) cut workers' hours in order to deal with higher costs under health care reform. Hall's big response to the critics? "It's very obvious that none of the liberals criticizing Schnatter, who founded and oversees the third-largest take-out and delivery pizza restaurant chain in the United States (behind Pizza Hut and Domino's Pizza), have anything anywhere near comparable business experience." That's it. Hall makes no effort rebut any of the claims being made such as that the estimated additional costs to Papa John's health care expenses are a tiny expenditure to a company the size of Papa John's -- it would add at most 14 cents to the price of a pizza -- and that Schnatter himself lives pretty ostentatiously. But then, NewsBusters and its Media Research Center parent have never been that interested in backing up their claims, have they? 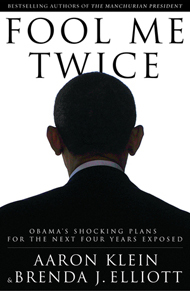 Aaron Klein's Obama-bashing book "Fool Me Twice" had absolutely no effect on the presidential election, despite a brief appearance on the New York Times bestseller list. But that's not keeping WorldNetDaily from pushing the book. A Nov. 8 WND article insisted Klein's book "may now be more relevant than ever" because it purportedly shows how Obama plans to "complete the fundamental transformation of America first pledged in 2008." In fact, despite WND's claim that Klein's book details what Obama will do, it's nothing but Klein's usual blend speculation and guilt-by-association. WND touted Klein's book again in a Nov. 11 article claiming that the book "documents how Obama may go about granting mass amnesty in his second term." Note the weasel word "may." That tells you the slipperiness with which Klein and co-author Brenda J. Elliott wrote the book. It's all speculation, not fact, despite WND's claim that the book "documents Obama’s specific second term agenda in all major policy areas." The article -- and,, presumably, Klein's book -- baselessly assumes that "immigration reform" and "amnesty" are the same thing. As we've detailed, "amnesty" has a specific meaning apart from immigration reform, and it's a term used (and misused) by critics of reform. At the Media Research Center, it seems, rantly louding is the same thing as "research." “We hear this from the liberal media every single time the Republicans don’t win something. They have only one solution for the Republican Party: don’t be conservative. It’s never about the failures of the candidates or a poor voter turnout effort. It’s that Republicans are too conservative – a false conclusion that ignores the successful campaigns of conservatives Ronald Reagan, George H.W. Bush, and George W. Bush. But nothing Bozell or the MRC presents here disproves the idea that conservativsm cost the GOP the election. Merely saying something is "false" doesn't equal proof. And Bozell's invoking the "the successful campaigns of conservatives Ronald Reagan, George H.W. Bush, and George W. Bush" ignores the fact that the American electorate has changed since the Reagan era in a way that appears to no longer favor current-day conservative policies. Yet, as we've seen, this sort of thing -- ranting and pre-determined conclusions -- has been what passes for "research" at the MRC for years. But for Americans faithful to the Constitution, the Declaration of Independence and the heritage of sacrifice and liberty that set apart this country from the rest of the world, it’s time to consider separation and divorce from those who have committed adultery.The election of 2012 provides more stark evidence that we are not really one country, indivisible, with liberty and justice for all. We are already two peoples – those of us still loyal and faithful to the God-inspired founding American principles and those who have gone awhoring after the idols of government coercion and doing what’s right in their own eyes. Barring a miracle, I don’t believe reconciliation with those who have gone awhoring is a possibility. I’m sorry, I just don’t have much in common with Barack Obama and Nancy Pelosi and George Soros and Bruce Springsteen (even though we are both from New Jersey) and George Clooney and these other looneys. No mention, of course, of Farah's own immorality in publishing all sorts of smears, rumors and lies in an attempt to destroy Obama, thus putting his own far-right agenda ahead of the truth. Ronald Kessler is not the only Newsmax writer to have issued a wildly inaccurate prediction of how the presidential election would go. Immigrant-basher James Walsh devoted an Oct. 26 column to insisting that President Obama "has never made any attempt to keep his six years of promises to the Hispanic community of Comprehensive Immigration Reform" and as a result, "President Obama may have a November surprise." Well, not so much. Despite Walsh's insistence that "the myth that the news media and politicians have created about a monolithic Hispanic voting bloc is just a myth" and that "about 57 percent of the Hispanic voters are favoring Obama, down from his 2008 number of 76 percent," Obama received 71 percent of the Hispanic vote and Mitt Romney only 27 percent, the lowest total for a Republican candidate since Bob Dole in 1996. Where do Republican leaders go from here? Realizing that, with a divided Congress, a comprehensive immigration reform package will not pass both House and Senate, House Republicans need to pass targeted pieces of immigration reform legislation. They can start with an improved version of the Bracero program (1942-1964), a flawed guest-worker program terminated by President John Kennedy. An updated Bracero program could relieve the illegal-alien problem perplexing the president and Congress. A 21st century Bracero program could provide guest workers with good housing, safe working conditions, income guarantees, and legal entry and exit papers. Such a program could protect national security concerns while providing the nation with a valued workforce, who would no longer need to pay “coyotes” (illegal alien smugglers) for high-risk entry to the United States. Why would anyone want an "improved" version of a flawed, decades-old program? Walsh doesn't explain that, nor does he explain why it was flawed in the first place. The bracero program mostly covered migrant farm workers from Mexico, who tended to be exploited by farmers. One federal official called the program "legalized slavery." Nevertheless, Walsh insists that "Immigration advocates, farm labor unions, and agricultural interests would welcome such legislation as a new beginning and a 21st Century legislative accomplishment." We're not sure how. We didn't get around to writing about this when it first came around -- it got lost in the shuffle of pre-election Obama-hate -- but it's still worth highlighting. The Media Research Center's Brent Baker took to the Fox News website on Oct. 23 to defend right-wing accusations that -- in the face of all honest fact-checking -- President Obama went on an "apology tour." Baker rather absurdly claimed that it's "flimsy reasoning" to point out that Obama never actually used the word "apologize." Baker even more absurdly bashed CNN's John Berman for failing to "understand the concept of a metaphor" by declaring that Obama's criticism of past foreign policy did not constitute an apology. There’s hardly a shortage, however, of examples of Obama chastising past U.S. foreign policy, so many so that just five months into Obama’s term the Heritage Foundation was able to produce a “Top 10 Apologies” list, starting with the speech in France which Berman quoted. While Baker cited an openly partisan group to back up his views, he made no mention of the fact-checkers that President Obama correctly noted backed up his claim that there was no apology tour. FactCheck.org: "Nowhere did we see that the president “apologized” for America. In some speeches, Obama was drawing a distinction between his policies and those of his predecessor, George W. Bush. In other instances, Obama appeared to be employing a bit of diplomacy, criticizing past actions of both the U.S. and the host nation, and calling for the two sides to move forward." PolitiFact: " We set out to discover whether Obama really had apologized in his speeches, and what he was apologizing for. But in our review of his words, we came up short. Yes, there is criticism in some of his speeches, but it's typically leavened by praise for the United States and its ideals, and often he mentions other countries and how they have erred as well. There's not a full-throated, sincere apology in the bunch. And so we rate Romney's statement False." Washington Post's Glenn Kessler: "The claim that Obama repeatedly has apologized for the United States is not borne out by the facts, especially if his full quotes are viewed in context." Indeed, the Heritage Foundation assessment Baker puts his faith in appears to take Obama's quotes out of context in order to paint them as part of an "apology tour." But that sort of slipshod and dishonest "research" is how the MRC operates as well -- to the point that it attacked fact-checkers for doing the fact-checking it wouldn't -- so it's no surprise that Baker would take refuge in it as well. Remember back in September 2007 when the far-left MoveOn.org created a firestorm with an ad placed at the New York Times headlined "General Petraeus or General Betray Us?" NBC's Matt Lauer apparently does, for on Monday's Today show, he asked guest Newt Gingrich, "Did David Betray, Petraeus do the right thing by resigning?" Sheppard hasn't said a word about this, however. 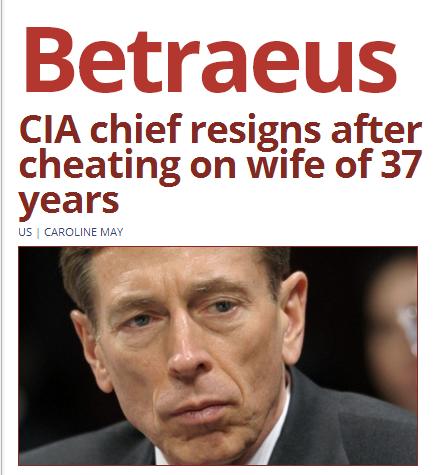 Apparently, it's OK for conservatives to say that about Petraeus, but not liberals. Sheppard might want to explain that double standard sometime. One of WorldNetDaily's longtime money-making schemes is charging its readers to send letters on their behalf, so it's no surprise that WND editor Joseph Farah would peddle the idea that the way to react to President Obama's re-election is to send him more money. I’m challenging the Obama campaign on the acceptance of those illegal donations. I’ve filed a Federal Elections Commission complaint at considerable cost. I have no illusions that it will be easy to challenge a sitting president within his own bureaucracy. But I’m doing it. Meanwhile, some in the press would prefer that I be charged with voter fraud for efforts to expose the system. I wouldn’t be a bit surprised if the Democrat machine tries something like that. We’re fighting to preserve America’s freedom here – nothing less. We’re fighting to preserve the concept of representative government – elections that actually mean something. We’re fighting to expose what no other news agency in the world apparently has an interest in exposing – the dark underbelly of corruption, fraud and abuse in our political system. The column includes numerous links to a page at the WND store for WND's "2012 Voter Fraud Challenge," in which it is noted that "WND filed a complaint with the Federal Elections Commission charging the Obama campaign with knowingly accepting foreign contributions without even a modicum of scrutiny," based on Klein's little identity fraud stunt. The page helpfully suggests that it will accept donations of up to $5,000. One has to wonder if Farah is simply ginning up anti-Obama hatred just so he can try to make a buck on it. The re-election of President Obama prompted some soul-searching on the part of Accuracy in Media's Cliff Kincaid -- though, sadly, not enough. In a Nov. 7 column, Kincaid noted how "prominent conservative news personalities made major miscalculations about where the election was heading and the nature of the two candidates and their campaigns,' and took Fox News to task since "the personalities on Fox News were wildly off the mark in their predictions for the election." Kincaid followed up with a Nov. 9 column in which he noted: "Conservative use of flawed polling data has played into the hands of the liberal media. In order to recapture credibility in covering politics, the conservative media will have to acknowledge not only the bias on the other side, but the bias on their own." But Kincaid has yet to acknowledge his own role in advancing conservative misinformation. As we pointed out, Kincaid laughably claimed on Nov. 1 that anti-Obama filmmaker Joel Gilbert "has nothing to hide" -- even as he refused to divulge who was funding the mass mailing of his film "Dreams From My Real Father" to households in swing states.Kincaid also ignored the fact that Gilbert's film has been discredited by Loren Collins, who has detailed Gilbert's falsehoods and deceptions. If Kincaid can't admit his own failings and deceptions, it's not really that much of a mea culpa. You know how a couple months back, WorldNetDaily did an ostensible debunking of a chain email about the number of executive orders President Obama has issued that nevertheless treated the claim as if it true? Well, they've done it again. When Barack Obama said on the campaign trail, “Voting is the best revenge,” was this what he meant? The quote, however, is suspect and is at best four steps removed from Jarrett herself. Though repeatedly widely in hundreds of blogs and even the website of a Philadelphia newspaper, the original source of the quote appears to be a blog site called The Ulsterman Report. Yet even “Ulsterman” doesn’t claim to have actually heard the words spoken. So, it's not true, and there's no proof that it is. Yet the headline and first two paragraphs of Zahn's article treats the invented quote as if it's real. That's not how you do a fact-check, Drew. From the folks who brought you the freakout over a mom painting the toenails of her 5-year-old son, it's ... a freakout over a boy wearing a dress on Halloween. The Media Research Center's Tim Graham uses a Nov. 10 NewsBusters post to go into freakout mode over a Huffington Post item by a woman (who works for CNN) who said her son wanted to dress up as the Disney fairy Silvermist for Halloween, and she helped put together the outfit. Graham sneered, "You might know you’re on The Huffington Post when you find an article headlined 'My Son Wore a Dress for Halloween.'" He continued, "Like a good liberal, she fears that her son will be pressured to change" and added that "the mother was ready to claw into anyone who suggested disapproval of this transvestite routine in any way." Remember, the MRC has quite the anti-gay agenda, and this extends to transgenderism, real or perceived. Though it's difficult to fathom how Graham ranting about a boy in a dress falls under NewsBusters' claimed mission of "exposing and combating liberal media bias."